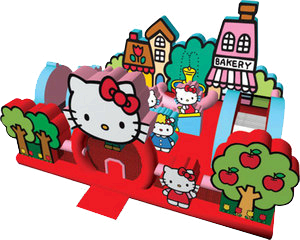 Join Hello Kitty, her sister Mimmy, and their furry friends in this fun and adorable Hello Kitty Toddler House Large Combo Design Bouncer. Perfect for kids ages 2-6. Pop-out obstacles, tunnel and mini slide will keep your kitty fans entertained for hours. Bright and colorful design. It features an inflatable safety ramp at the entrance to protect excited kids as they scramble to get inside the bouncer. It also has large netted vent windows that keep things cool for the kids and allows parents to keep a watchful eye on all activities inside. Appox 6-8 users at a time.